If you’re looking for a high quality, stylish washing machine that’s manufactured by one of the industry’s most trusted brand names, look no further than our exciting range of Smeg washing machines. Built to the highest of standards and available in a wide variety of colours, styles and sizes, these energy efficient appliances reduce your daily workload, and keep your clothes looking and smelling fresh. All of our Smeg washing machines have of capacity of 7kg, boast an energy efficiency rating of A++ or A+++, and are capable of a spin speed of 1400 rpm. Whether you’re looking for a sleek and modern washing machine or a colourful appliance that brings the room to life, we’ve got what you need. Perhaps the most popular Smeg washing machine in our range, the Smeg WMI14C7-2 Integrated Washing Machine is an affordable option that’s packaged with a one year manufacturer’s guarantee. 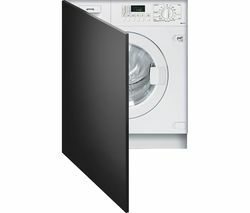 It’s the perfect choice for those who want a washing machine that’s easy to hide away and be kept out of sight. It’s a flexible appliance that boasts useful delay timer settings, a variety of pre-set programs, and wool wash settings that ensure your woollen garments are afforded the delicate touch they require. These washing machines can easily be combined with a tumble dryer, or you may want to check out our integrated washing machines if you’re looking to purchase an appliance that’s easy to slot into a new or refurbished kitchen or washroom. We stock appliances designed by a number of the biggest brand names available, including Hoover, Hotpoint, AEG, Beko and Bosch, amongst others, ensuring we’re able to satisfy all of our customers’ needs.